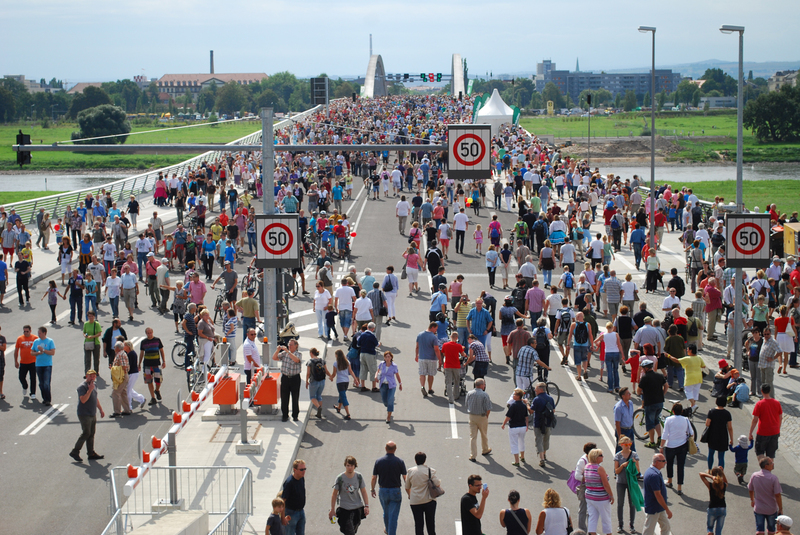 Dresden opened this weekend the Waldschlößchenbrücke for the public (and on Monday for traffic) and they had a big party to go with the grand opening. 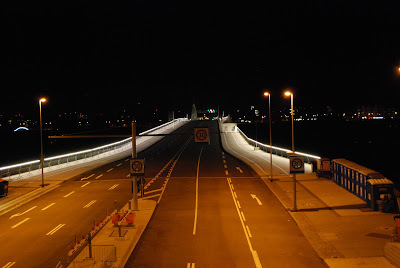 There had been a lot of controvery, with a public vote if the bridge should be built or not (the vote was 67.9% pro); discussions on how to protect the hoseshoe bat, which may of may not be disturbed by the traffic on the bridge, and finally did cost the Dresden Elbevalley the world heritage title (Dresden was de-listed 2007 because of this project). I decided to stay for the weekend to join the party and watch the fireworks. It seems that Dresden just can't celebrate something without having a big firework and according to the interweb one was planned for 10pm on Saturday. As I live closeby, a friend that had come to visit and I decided to wait until 9:45pm and then go to watch the show. When we checked out the bridge, all was quite. Very quite. At least the next morning, the picture was very different. There were tousands of people who took a change to walk across the Elbe and back. And, of course, so did we. On the other side, there was food and displays by the fire brigade, the public transportation system in Dresden, Newspapers and so on. Bands were playing and a group was walking around on stilts. 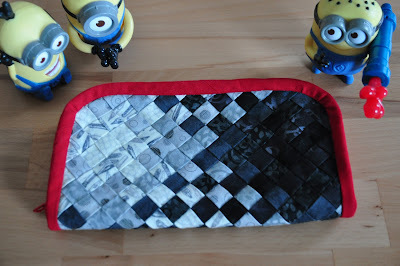 For the backside of my 'Oh My Stars!" blanket I've had bought about 3.2m of blue fabric in the assumption that this would be enough. Well, as I turned out, it wasn't, so I had to improvise a little and added some stripes of white at one side. As I also wasn't super happy with the shade of blue, I decided to dye the backside, binding of some bits of the fabric with rubber bands beforehand. 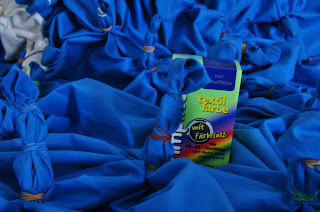 I threw it into the washing machine with a pack of blue color and hoped for the best. 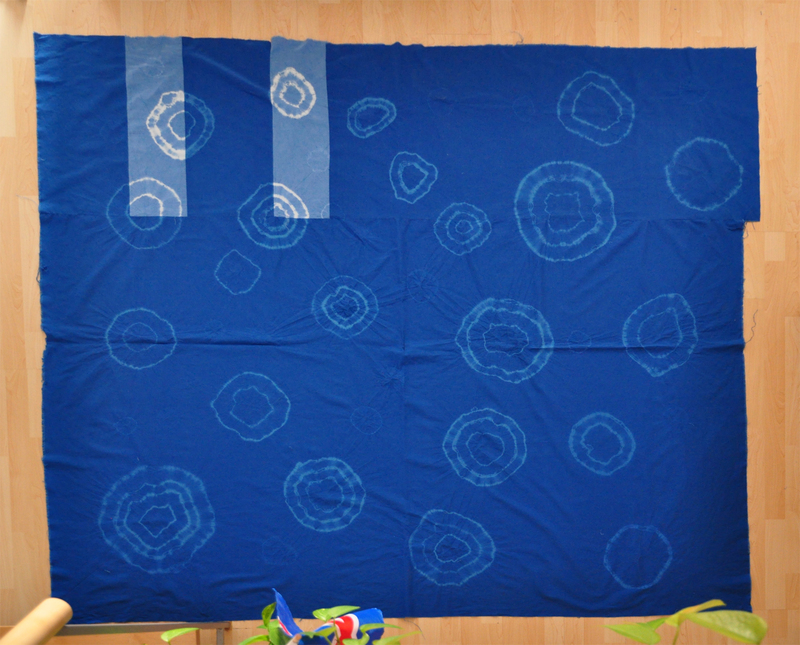 Though I got some pretty circles, the difference in color is not that big (rubber bands worked quite well, but the bits where I used some string didn't work out at all). I knew this would happen from the start, and already bought a second, darker shade op blue for the second round. So there will be a second dying cycle next week when I have a bit of time. 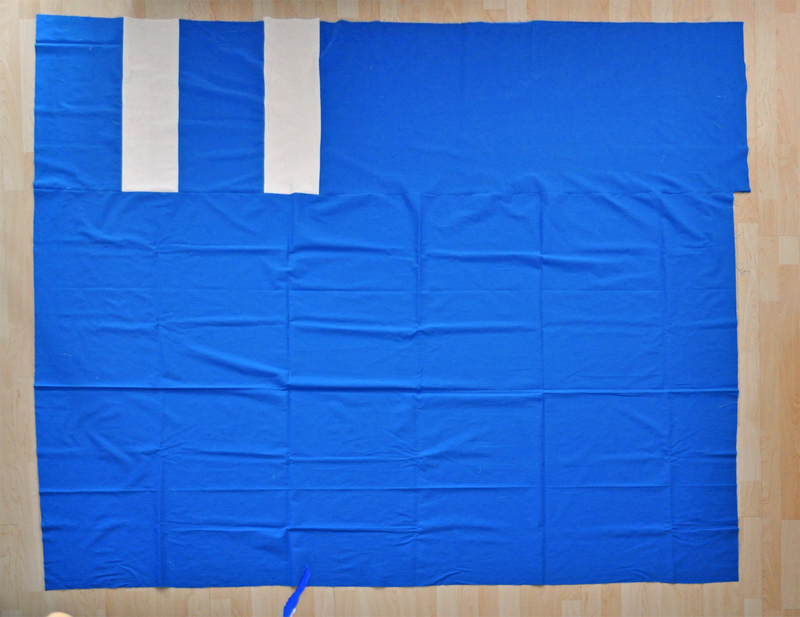 I also did a bit of decoration in my living room where I always had an empty area of sky blue wall. 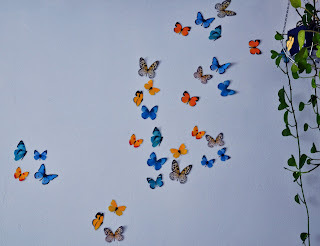 I found the butterflies at Ikea and knew that this was it. I really love my swarm of butterflies. According to Wikipedia "a tessellation is the tiling of a plane using one or more geometric shapes, called tiles, with no overlaps and no gaps"
M.C. Escher was very famous (among other things) for his tessallations using animals like fish and birds. 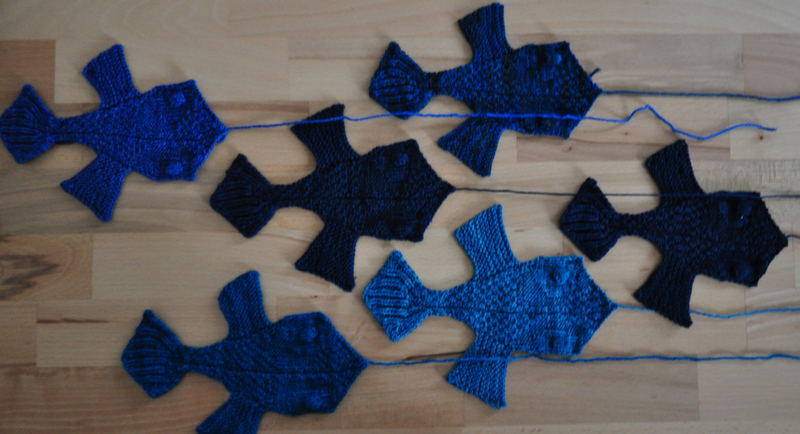 janukke, a lovely lady at Ravelry, did come up with a knitting pattern (for an afghan) for the fish tessallation a while ago, and finally I gave it a shot and knitted one of the fishies. And another one. And then another one. 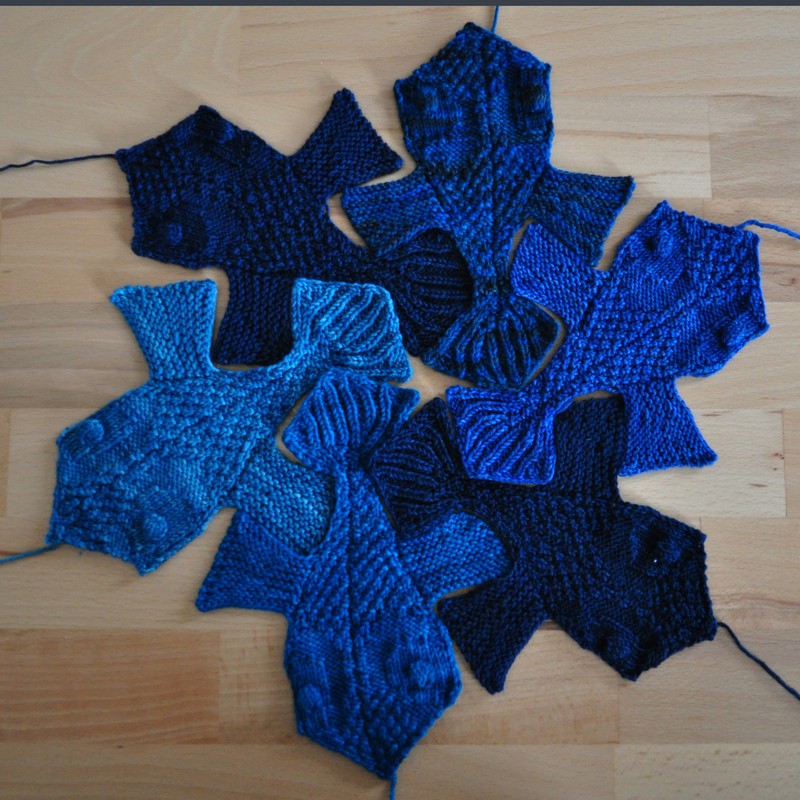 I'm now at number 6 and can at least lay out the first of the hexagons. The pattern is not super difficult, but it does require a lot of attention, so it's far from easy, mindless knitting, but one has to admire the sheare brilliance that has gone into designing the fishes. I've still got a long way to go and I plan this as a background project, so it will be a long time before I actually have something blanket like. 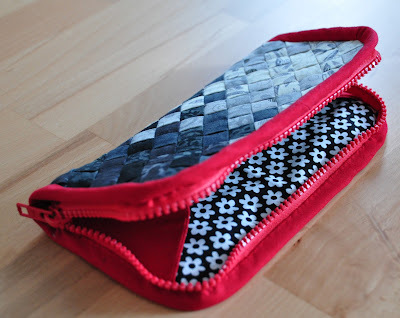 On the sewing front I've put this little etui together using braided stripes for the outside. My minons are quite intreagued what it might contain, but, sorry boys, at the moment there's nothing of interest inside.